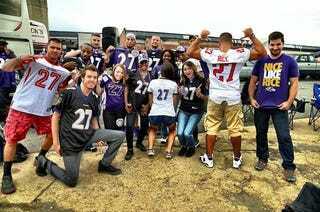 What would possess a fan to wear a Ray Rice jersey last night? Nearly every one—and there were more than a few—said they wanted to make the statement that Rice doesn't deserve what's happened to him. Here are selected fans' justifications for continuing to sport Rice's No. 27, collected from interviews with Fox Sports 1, the AP, FTW, and the Washington Post. All but the last are from women. "I think whatever happened in that elevator happened in February and should have been done in February. I've met the guy. He's such a sweet guy. He never said no when I asked for pictures or an autograph or anything. And it's their business. His wife obviously forgave him, why can't we?" "I'm making a statement. I don't believe in domestic violence, but I will say: any woman who can hit a man, a man shouldn't have to sit there and take the abuse. The abuse goes both ways...As a woman, she shouldn't have hit him." "I would tell Ray Rice I don't agree with how far he went, but he's human and I support him." "I'm supporting him all the way around. I think he's an awesome guy, I think he's an upstanding guy, and I think he's an awesome football player." "There's two sides to every story. I saw the video. That's their personal business, and it shouldn't have affected his career. I don't agree with domestic violence, but she's still with him, so obviously it wasn't that big of a deal. Everyone should just drop it." "He is a Baltimore Raven always and forever. We make mistakes, we get over them. We don't need America to judge him." "I think it's ridiculous. I think it's a shame that his college has taken down his accomplishments. I think his wife is just as much to blame." Paul Kilduff, 65, put two pieces of duct tape over the letters "Ray R" on the back of his faded shirt so that it read "Be Nice" instead of "Ray Rice." But the tape kept falling off, so he took off the jersey, then put it back on without the tape while uttering, "Ah, I might as well." "Everybody deserves a second chance," he said, a refrain heard often in the parking lot.